I just don’t have the patience or energy to give Lethal White the kind of post I want to. So let me be brief — this picks up minutes after the end of Career of Evil and we spend a few pages with Strike and Robin trying to have an actual conversation at her wedding. It almost goes well, but between Matthew, her family, Strike’s drinking . . . yeah, well. It was a good start. Then eleven months and change fly by and we get to the thick of the novel (pun absolutely not intended, but very fitting), so let’s cut to the Publisher’s Blurb to sum that up. Trying to get to the bottom of Billy’s story, Strike and Robin Ellacott–once his assistant, now a partner in the agency-set off on a twisting trail that leads them through the backstreets of London, into a secretive inner sanctum within Parliament, and to a beautiful but sinister manor house deep in the countryside. 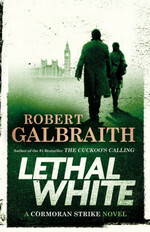 The most epic Robert Galbraith novel yet, Lethal White is both a gripping mystery and a page-turning next instalment [sic] in the ongoing story of Cormoran Strike and Robin Ellacott. If by “most epic Robert Galbraith novel yet,” they mean the longest, well, yeah. That’s certainly the case. Wow, this thing was long — you can argue bloated, even. At the same time — while lamenting the week it took me to get through this — I don’t know what I’d cut if given the opportunity. Everything I’ve thought could be lost, can’t be without ruining something else. It’s real a testament to Galbraith’s skill that there’s really nothing wasted, everything sets up something else. But man, I wish that wasn’t the case. And, yeah, fill up the comment section with how I’m wrong about that, I’m more than willing to be convinced. But what makes all of the work worth it? The scenes where Strike and Robin work together, think through things together, or even just talk like friends together. In short — Strike and Robin together. It doesn’t happen enough — and, honestly, there’s some sloppy, soap opera-ish machinations keeping that from happening the way it should (well, okay, the way I want it to). I honestly don’t care one way or the other if they ever get together (as inevitable as it seems) — I just want them working together. The other great thing is the way that the events of Career of Evil have impacted Robin and the way she’s reacting to that impact. I don’t want to say more, but I loved this. Lastly, the nature of the murders at the core of the book stand in sharp contrast to some of the murders in earlier Strike novels. Some novelists get stuck in a rut and all the murderers/motives/methods become variations on a theme — each one more extreme than the previous. Galbraith dodges that here, and that pleases me a lot. There’s a lot more that could be discussed — and I hope others do (or inspire me with a comment to do so). Good mystery, good character development (some well overdue), I enjoyed all of the characters, etc., etc. But I’ll leave it at that — I’m glad we got another book, and am looking forward to the next already. I just hope it’s a little leaner.